Spanning over one hundred years, from the antebellum era to the 1980's, A Shout in the Ruins examines the fates of the inhabitants of Beauvais Plantation outside of Richmond, Virginia. When war arrives, the master of Beauvais, Anthony Levallios, foresees that dominion in a new America will be measured not in acres of tobacco under cultivation by his slaves, but in industry and capital. A grievously wounded Confederate veteran loses his grip on a world he no longer understands, and his daughter finds herself married to Levallois, an arrangement that feels little better than imprisonment. And two people enslaved at Beauvais plantation, Nurse and Rawls, overcome impossible odds to be together, only to find that the promise of coming freedom may not be something they will live to see. Seamlessly interwoven is the story of George Seldom, a man orphaned by the storm of the Civil War, looking back from the 1950s on the void where his childhood ought to have been. Watching the government destroy his neighborhood to build a stretch of interstate highway through Richmond, he travels south in an attempt to recover his true origins. With the help of a young woman named Lottie, he goes in search of the place he once called home, all the while reckoning with the more than 90 years he lived as witness to so much that changed during the 20th century, and so much that didn't. As we then watch Lottie grapple with life's disappointments and joys in the 1980's, now in her own middle-age, the questions remain: How do we live in a world built on the suffering of others? And can love exist in a place where for 400 years violence has been the strongest form of intimacy? 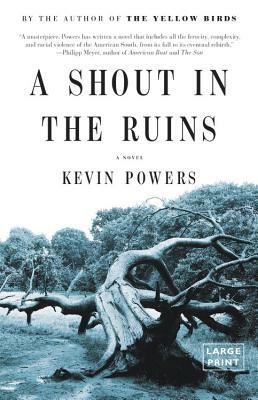 Written with the same emotional intensity, harrowing realism, and poetic precision that made THE YELLOW BIRDS one of the most celebrated novels of the past decade, A SHOUT IN THE RUINS cements Powers' place in the forefront of American letters and demands that we reckon with the moral weight of our troubling history.